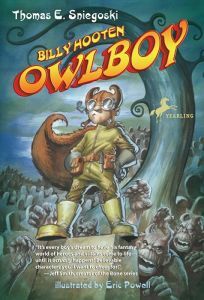 Comic book scripter and novelist (The Fallen quartet) Sniegoski launches the Owlboy series with this corny caper introducing a 12-year-old geek, Billy Hooten. When Billy responds to a cry for help emanating from a mausoleum, he finds Archebold, a tuxedo-clad goblin about to be flattened by a boar-like monster. When that creature slips on a pile of bones and is knocked unconscious, Archebold credits Billy for besting the beast and declares the boy the next Owlboy, a comic book crime-fighter. The goblin escorts the fledgling superhero (who wears a feathered costume, horned leather helmet and goggles) through a coffin in the mausoleum down to Monstros City, where he must complete a series of outlandish trials to officially assume the Owlboy mantle. With its loopy antics, throwaway quips and descriptions of Monstros City's outrageous residents (one resembles a praying mantis sporting a blond wig and miniskirt; another looks like an asparagus spear), this tale has silliness to spare. Ages 9-12.